I have a hair type that basically demands it be washed daily. Not thick, not thin. Greasy roots that show oil. Straight and brown. Oh brown hair and your ability to glisten when you take on grit and oil. These are the moments that make me wish I was a curly thick headed blonde. While I was on maternity leave for two months I didn't exaclty plan to not wash my hair, the screaming newborn and being home alone with zero help during the day just sort of caused me to not wash it. I was just doing good to bathe. At the end of the first 6 weeks I started to notice that by not washing my hair daily it had quit looking so greasy on day 2. By that point I started spraying in the hair spray and doing whatever I could to maintain this every other day washing for when I went back to work in May. In June I read a blog post about how someone went 5 days between washing, without using product. That just won't do for my hair. Welcome July, and I've devised a way to stretch it out to three days between shampooing when I need to. So if you've got medium hair (not fine or thick really) that's straight, shiny, and likes to take on oil... here's how I managed to quit washing my hair every day. First let me say it again, it took nearly 2 months for my hair to adjust to going every other day with washing. That meant I washed on Sunday, Tuesday, Thursday, and Saturday depending on what I was doing. If I was just staying home I skipped and just looked awful so I didn't have to wash twice in a row. Day 1 - Wash & Condition Day - after washing I spray it with Frizz Ease 3 Day Straight, use mousse on my roots, and a argan oil on the very ends. After I blow dry I spray my roots and all around with a light hair spray. Day 2- I spray a tiny bit of my dry shampoo concoction I found on Pinterest on my roots at the top of my head and around the roots closest to my hair and then blow dry to dry the product. (recipe for the dry shampoo below) I use a round brush to smooth any creases from sleeping. Then depending on how my hair is doing that day I will do one of the three hair styles in the pic above for day 2, I typically land on the second two. My bangs have to be up or the grease factor is crazy! Oh and more hair spray... it's my grease saving grace. 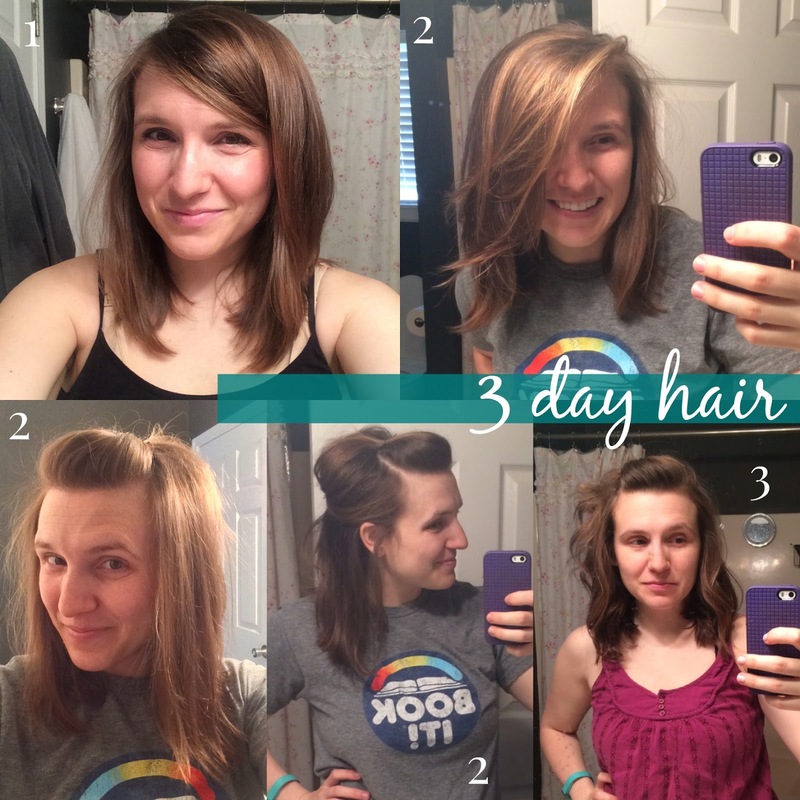 Day 3 - A bit more of the dry shampoo and I do the same thing blow drying it out as on Day 2. By day 3 I can't have my hair down long and I like to curl it to add texture and make it look messy on purpose, I like to start off with it down but it always ends the day in a messy pony tail. Depending on how I do getting the kid ready and out the door we may be on a 3 day every time schedule in the fall. Place in a spray bottle and shake to combine before using. Spray into oily hair at the roots and blow dry.